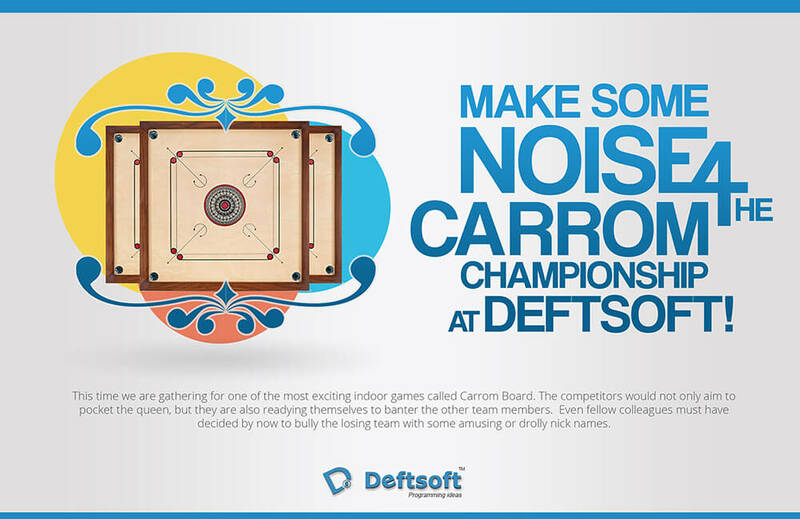 Make some noise for the Carrom Championship at Deftsoft! At Deftsoft, we believe that friendly working atmosphere acts like a fuel for the engine, and also to get our employees to the pinnacle of productivity. The amicable environment does not only let you work with the most sincere approach, but it also allows you to be yourself. To beat the stress factor, time to time, we keep on arranging some dynamic fun activities, so that our bench strength can laugh out loudly with officemates from their busy working schedule. From SEO to Content Writing, PHP to Designing, iPhone to Android; employees from all the domains would gather at Deftsoft premise, to share some friendly moments amongst themselves. This time we are gathering for one of the most exciting indoor games called Carrom Board. The competitors would not only aim to pocket the queen, but they are also readying themselves to banter the other team members. Even fellow colleagues must have decided by now to bully the losing team with some amusing or drolly nick names. Well amusingly, in case of Project Managers to Team Leaders, they all are ready to flick a striker on the carrom board, to showcase their abilities before their team members and management. So, Deftsoft proudly announces the upcoming Carrom Championship where a winner would emerge out with astute skills and deft strategy. Let’s check out who is going to be the one with the winning trophy and all the laurels.